Guardian Angel Sports Club managed to draw their opening game of Goa Professional League against Santa Cruz Club of Cavelossim played tody at Duler Stadium, Mapusa. Melvin Fernandes scored the first goal of the League for Santa Cruz in the 14th minute with a perfect header from inside the box after receiving a delightful cross from Joshua Vaz. Guardian Angel's Lavino Fernandes restored the parity in the 31st minute for his team with a fiery shot into the opposition's net. Santa Cruz were awarded a penalty by the referee just five minutes before the half time when Joshua Vaz was brought down by Guardian Angel's Sanvil D'Costa inside the box. 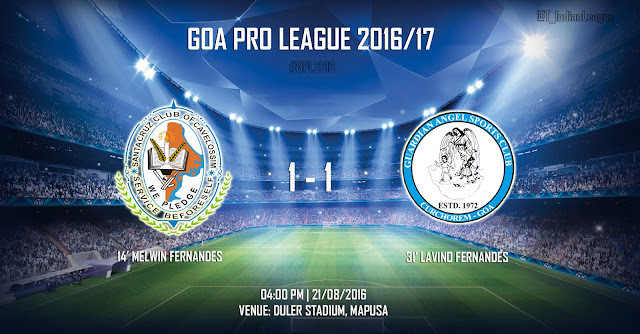 Melvin Fernandes failed to convert from the spot as opposition's custodian Ram Swaroop rightly anticipated the kick to block the shot. 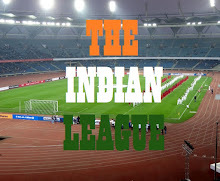 The match went into Half-Time with scores level at 1-1. Both the teams came out all guns blazing in the 2nd half trying to get the lead. Both the teams came close to score but none were able to get the ball into the rival's net. In tomorrow's fixture, Dempo SC will take on Clube Sao Miguel de Taleigao at Duler Stadium. Kick Off: 04:00 PM.